This afternoon, 62 members of the Class of 2020 were inducted into the National Honor Society. 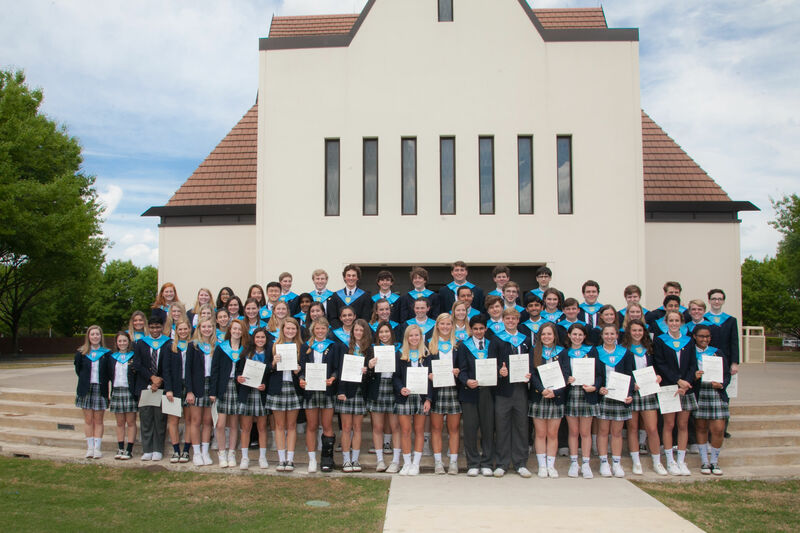 The induction ceremony took place in All Saints Chapel and was enjoyed by parents of the inductees, as well as the freshman, sophomore, and remainder of the junior class. NHS Vice President Lauren Marks '19 spoke about the history and importance of the organization before NHS President Jay Browne '19 introduced the speaker for the event, T.J. Frank. Following the speech, current NHS Secretary, Mackenzie Fain-Parish '19, and Treasurer, Michael Wirtz '19, presented the inductees. Kerrm Ahsan, Jordan Aikman, Virginia Baker, Lily Baughman, Cambridge Bender, Sameer Bhasin, Catherine Blaylock, Abby Brand, Riley Breaux, Ava Brennan, Elizabeth Carrie, Sunny Courtwright, Emily Delgado, Ned Dockery, Jade Donahue, Max Duffner, Spencer Dunn, Lauren Egger, Kate Flanagan, Meera Gangasani, Zeke Gibson, Sabrina Gies, Sydney Goodiel, Claire Groves, Zan Haq, Nick Harapanahalli, Julia Hicks, Aidan Hieber, Henry Isom, Lily Jackson, Kevin Jin, Ty Johnson, Brian Jones, Grace Judin, Daniel Kaplan, Jack Loftus, Caroline Massey, Selam Mekbeb-Gillett, Christopher Miller, Tarun Mittal, Braden Montgomery, Val Mooty, Rachel Morrow, Sarah Morrow, Humza Naseem, Arrington Nelson, Biz Newsom, Ashley Owens, Amanda Park, Isabella Pfister, Charlotte Podeszwa, Abby Ragan, Sohaib Raza, Austin Russell, Garrett Seymour, Hadley Smith, Sarah Smith, Grace Thomas, Allie Warnecke, Sofia Weinstein, Meg Wilson, and River Woods.